Summer camps are probably the best opportunities youth ministers have to offer an unforgettable experience that will leave a lasting impression upon their teens. But summer camps are expensive! What do you do when many of your families can’t afford it? Do you just give out discounts? I found an online resource that helped us fundraise $3,000 to resolve this problem! 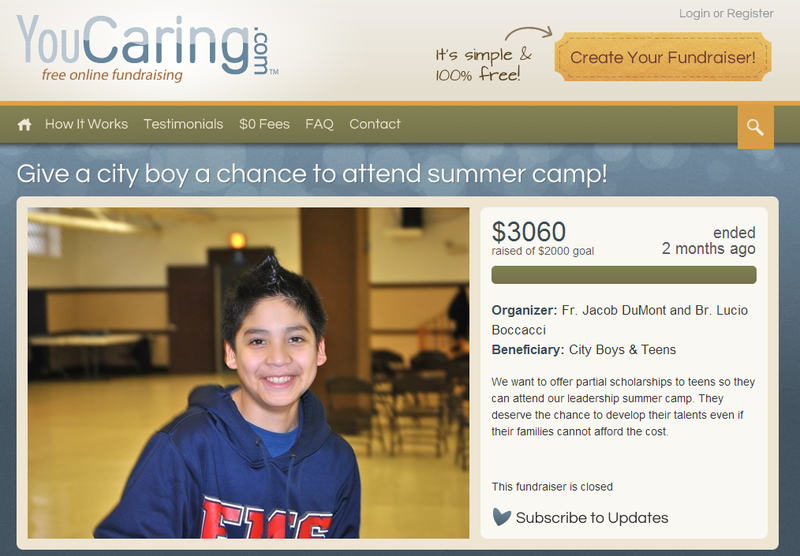 Our summer camps in Chicago this year (2013) cost $300, whether you came to our middle school or high school summer camp. Compared with what we offered, and how much we prepared for them, it was a real steal! However, just like in all the summer camps I’ve organized, a good portion of our target families simply could not afford it. We could offer them a discount, as I have always done, but then I run the risk of sinking the whole camp. I started wondering if I could ask people if they would sponsor a camper. Because you can find anything online, I looked up “fundraising for summer camp scholarships”. All kinds of online fundraising websites came up, and I eventually settled for YouCaring at www.youcaring.com. The basic concept is simple: setup your free internet profile with a description of your cause, connect it to a WePay or Paypal account, get the word out online and by email, and then just pray and watch! The site helps you navigate through each of the steps and in a matter of moments you are ready to go! YouCaring offers you buttons with which to share via Facebook, Twitter, Google+ or email. It also creates a simple website link for you to share. It automatically gives visitors the same social media buttons so they can then like and share the page. It’s important to note that while the website offers you a platform from which to fundraise, it does not do the fundraising for you! The youth director, Fr. Jacob DuMont, still had to send personal emails to the people he thought would most likely contribute. In that email he included the link to our fundraiser. The profile made our project look very professional, and the description and pictures allowed our benefactors the space, time and privacy to think about how much to donate. All the donation is done online via credit card or PayPal, which makes it easy for people to donate and for you to cash in your donations. There is a small fee to process the credit card, but this is normal. You can nevertheless include your mailing address in case someone prefers to mail in a check. The results were very encouraging! As you can see from the above picture, we ended up fundraising $3,000! This time, we didn’t have to give out discounts without real money to back it up. It was as if all of our teens came to camp and paid a full price, regardless of whether or not their families could afford it. Our summer camp budgets were solid. A few people donated anywhere from $50 to $200, but the largest, most unexpected donation was a gift of $2,000 from one family! It was a big surprise, and without much effort we fundraised $1,000+ more than we had set as a goal. Since we are part of a non-profit organization, we were able to give tax-exempt letters to our donors as an added ‘thank you’. So what’s the catch? What does YouCaring charge you to setup this website? How does YouCaring fund itself as an organization? The answer is very simple. Everything is for FREE. When your benefactors are about to type in how much they wish to donate, YouCaring asks them for a small donation to help cover operating costs. Benefactors can easily uncheck that box without muchconcern. I believe this proves it is definitely possible and easy to fundraise for our summer camps, especially because we are offering our teens something very valuable: a chance to experience the joy, newness and friendship of Christ in a powerful, deep and lasting way. This online resource helped us connect families that are willing to support a good cause with those families that need financial assistance. It also helped our youth ministry team avoid much of the fear and awkwardness that comes with asking people for donations. My recommendation for you is to pick a single project or cause and try it out. There are many other kinds of online fundraising websites out there, such as www.kickstarter.com, www.gofundme.com, and more. Simply type in “free online fundraising website” in Google and take some time to explore the options until you get a best fit. YouCaring was a great fit for us because it works best with single projects with a clear deadline. So whether you are fundraising for teens to attend summer camp, or to help support a mission to another country, or whatever your cause, you and your computer can make that happen! Posted in Youth Ministry 101Tagged camp costs, discipleship, evangelization, fundraising, new architects, resource, scholarships, showcase ideas, summer camps, youth ministryBookmark the permalink.